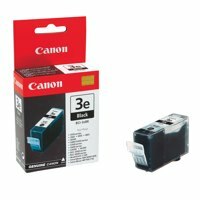 To get the very best results from your Bubble Jet printer, this genuine Canon BCI-3EBK Black Ink Tank is the perfect solution. With an ink that is vivid and precise, this replacement ink tank is ideal for eye-catching prints. Canon knows its machines better than anybody and they know how to get the very highest level performance from their printers leaving you with results that are incomparable. Each cartridge is easily installed into your machine and contains 13ml of ink for long-lasting, reliable output.